Valdivia, Valparaíso, Santiago de Chile, Temuco, Talca, Concepción, Viña del Mar, Osorno, Puerto Varas, Villarrica. German Chileans (Spanish germanochilenos, German Deutsch-Chilenen) are Chilean citizens who derive their German ancestry from one or both parents. They are chiefly descendants of about 30,000 immigrants who arrived between 1846–1914, most following the Revolutions of 1848 in the German states. In the 1907 census, Germans were the fifth-largest immigrant group in Chile, after Bolivians, Peruvians, Spaniards and Italians. From the middle of the 19th century to the present, they have played a significant role in the economic, political and cultural development of the Chilean nation. The 19th-century immigrants settled chiefly in Chile’s Araucanía, Los Ríos and Los Lagos regions in the so-called Zona Sur of Chile, including the Chilean lake district. The first German to feature in the history of what is now Chile is Bartolomé Blumenthal (Spanish alias Bartolomé Flores) during the 16th century who accompanied Pedro de Valdivia. The latter conquistador ousted the indigenous population and founded the city of Santiago. Valdivia also arrested and took hostage the Cacique (tribal leaders and chiefs) to weaken the society of the local Mapuche people. Blumenthal took part in the defence of the Spanish settlement of Santiago when the Mapuche launched a counter-offensive on 11 September 1541 in attempt to free their caciques held hostage by the conquistadores. Later Blumenthal took part in the consolidation of the Spanish settlement that would become the Talagante Province; he was the first engineer in the remote colony. Blumenthal’s son-in-law, Pedro Lisperguer (born Peter Lisperger in Worms, Germany), was appointed as mayor of Santiago in 1572. Johann von Bohon (known in Spanish as Juan Bohón) was also part of Valdivia's expedition and was ordered to establish the city of La Serena in 1544. In 1818 Chile became independent from Spain and began to engage in trading with more nations. The port city of Valparaíso became a major center for trade with Hamburg, with commercial travellers and merchants from Germany staying for lengthy periods of time to work in Valparaíso. Some settled there permanently. On 9 May 1838 Club Alemán de Valparaíso, the first German cultural organization was established in the city. German residents and visitors held cultural functions here. The club began to organize literary, musical and theatre productions, contributing to the cultural life of the city. Aquinas Ried, a physician, became widely known in the city for composing operas, and for writing poetry and plays. The club had its own orchestras and academic choir (singakademie) which would perform works composed by local musicians. During World War I, the German Club of Valparaiso welcomed Admiral Maximilian von Spee's East Asia Squadron of the Imperial German Navy after they fought the Battle of Coronel off the Chilean coast. The Chilean government encouraged German immigration in 1848, a time of revolution in Germany. Before that Bernhard Eunom Philippi recruited nine working families to emigrate from Hesse to Chile. The expansion and economic development of Valdivia were limited in the early 19th century. To stimulate economic development, the Chilean government initiated a highly focused immigration program under Vicente Pérez Rosales as government representative. Through this program, thousands of Germans settled in the area, incorporating then-modern technology and know-how to develop agriculture and industry. Some of the new immigrants stayed in Valdivia but others were given forested land, which they cleared for farms. For ten years after the Revolutions of 1848 in the German states, numerous liberal immigrants came from Germany, exiles of the revolutions. They settled primarily in the Llanquihue in the towns of Frutillar, Puerto Octay, Puerto Varas, Osorno and Puerto Montt. Around 1900 Valdivia prospered with industries, including the Hoffmann Gristmill and the Rudloff shoe factory. By the mid-1930s, most of the farming land around the towns of Valdivia and Osorno had been claimed. Some German immigrants moved further south to places such as Puyuhuapi in the Aysén region. German settlers in Aysén Region in the 1930s. Subsequently, a new wave of German immigrants arrived in Chile, with many settling in Temuco, and Santiago. 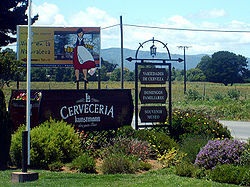 Many founded businesses; for example, Horst Paulmann's small store in the capital of the Araucanía Region grew into Cencosud, one of the largest businesses in the region. German settlers in Aysén Region in 1951. Even before the Nazi takeover of Germany in 1933, a German Chilean youth organization was established with strong Nazi influence. Nazi Germany pursued a policy of Nazification of the German Chilean community. These communities and their organizations were considered a cornerstone to extend the Nazi ideology across the world by Nazi Germany. Most German Chileans were passive supporters of Nazi Germany. Nazism was widespread among the German Lutheran Church hierarchy in Chile. A local chapter of the Nazi Party was started in Chile. During World War II, many German Jews fled to Chile before and during the Holocaust. For example, the families of Mario Kreutzberger and Tomás Hirsch came to Chile during this time. Shortly after World War II, former members of Nazi Germany tried to take refuge in South America, including Chile, fleeing trials against them in Europe and elsewhere. Among these was SS Standartenführer and war criminal Walter Rauff. Paul Schäfer, a former army medic, founded Colonia Dignidad, a German enclave in the Maule Region, in which abuses against human rights were allegedly carried out. The precise number of Nazi refugees hidden in Chile after WWII remains unknown. Raw beef crudos are considered a typical German-Chilean dish similar to the German mett. The one in picture are from Café Hausmann in Valdivia. The exact number German-Chileans is unknown because many of the early arrivals' descendants have intermarried and assimilated over the past 150 years. According to the last census, there were 5,906 German-citizens living in Chile. An independent estimate calculates that about 500,000 Chileans could be descendants of German immigrants. An estimated 20,000 Chileans speak the German language. There are also German schools and German-language newspapers and periodicals in Chile (e.g., Cóndor – a weekly German-language newspaper). Claudio Bunster, scientist, theoretical physicist, won the Chilean National Science Award in 1995, and contributed to founding of the Centro de Estudios Cientificos (Center for Scientific Studies) in Valdivia. Juan Brüggen Messtorff, contributed to the development of geology in Chile. Otto Dörr Zegers, psychiatrist, intellectual and writer, translated the work of Rainer Maria Rilke into Spanish. Hermann Eberhard, explorer, founder of the first settlements in western Patagonia and discoverer of the fossils of the Giant sloth at the Cueva del Milodon Natural Monument in Chile. Miguel Kast, neo-liberal economist and conservative politician, trained under Milton Friedman at the University of Chicago, a functionary of Augusto Pinochet's military dictatorship and architect of the Chilean economic shock therapy, known as the Miracle of Chile. One of his children, Felipe Kast, was a presidential precandidate in the 2017 Chilean presidential primaries for Chile Vamos, and his younger brother, José Antonio Kast was a candidate for the presidential elections of 2017. Emil Körner, German-born Chilean army commander, veteran of the Austro-Prussian War and the Franco-Prussian War, invited by the Chilean government to retrain the Chilean Army in the German military doctrine in 1900, and commander-in-chief of the Chilean Army during the Chilean Civil War. Fernando Matthei, former commander of the Chilean Air Force. Member of the military junta that ruled Chile, Matthei was the first admit that the regime had lost the referendum to elect Pinochet in 1988. One of his children, Evelyn Matthei was a candidate in the presidential elections of 2013. Manfred Max Neef, economist and academic, winner of the Right Livelihood Award in 1982. Alfredo Perl, Chilean-German classic pianist, conductor of the Detmold Chamber Orchestra, Germany. Rodolfo Armando Philippi, naturalist, director of the Chilean National Museum of Natural History and founder of the first Chilean Botanical Garden. Raúl Rettig Guissen, politician, chairman of the Rettig Report, documenting human rights abuses and disappearances during the dictatorship of Augusto Pinochet. Egon Wolff, Chilean playwright, author and faculty member of the Pontifical Catholic University of Chile. His work has been produced in 29 countries and translated into 19 different languages. Max Westenhöfer, scientist, physician and pathologist; disciple of Rudolf Virchow. Westenhöfer is considered the founder of Chilean anatomic pathology and social medicine. Many Germans who migrated to Chile practice Roman Catholicism, but also Lutheranism. ^ Sondhaus, Lawrence (2014). The Great War at Sea: A Naval History of the First World War. Cambridge: Cambridge University Press. p. 76-77. ^ "Alemanes en Chile: entre el pasado colono y el presente empresarial" (in Spanish). Deutsche Welle. 31 March 2011. Retrieved 22 December 2012. Spanish: Hoy, el perfil de los alemanes residentes aquí es distinto y ya no tienen el peso numérico que alguna vez alcanzaron. En los años 40 y 50 eran en Chile el segundo mayor grupo de extranjeros, representando el 25%(213.000 alemanes). Según el último censo de 2002, en cambio, están en el octavo lugar: son sólo 5.500 personas, lo que equivale al 5% de los foráneos. Sin embargo, la colonia formada por familias de origen alemán es activa y numerosa. Según explica Karla Berndt, gerente de comunicaciones de la Cámara Chileno-Alemana de Comercio (Camchal), los descendientes suman 500.000. Concentrados en el sur y centro del país, donde encuentran un clima más afín, su red de instituciones es amplia. 'Hay clínicas, clubes, una Liga Chileno-Alemana, compañías de bomberos y un periódico semanal en alemán llamado Cóndor. Chile es el lugar en el que se concentra el mayor número de colegios alemanes, 24, lo que es mucho para un país tan chico de sólo 16 millones de habitantes', relata Berndt. ^ Peter Rosenberg. "Deutsche Minderheiten in Lateinamerika (German)" (PDF). Europa-Universität Frankfurt/Oder. Archived from the original (PDF) on 2 November 2012. Retrieved January 22, 2013. ^ "Deutsche Schulen in Chile (German)" (PDF). The German Embassy in Santiago. November 25, 2011. Retrieved January 22, 2013. ^ "Deutscher Bundestag 4. Wahlperiode Drucksache IV/3672" (Archive). Bundestag (West Germany). 23 June 1965. Retrieved on 12 March 2016. p. 20-24/51. This page was last edited on 19 February 2019, at 01:55 (UTC).